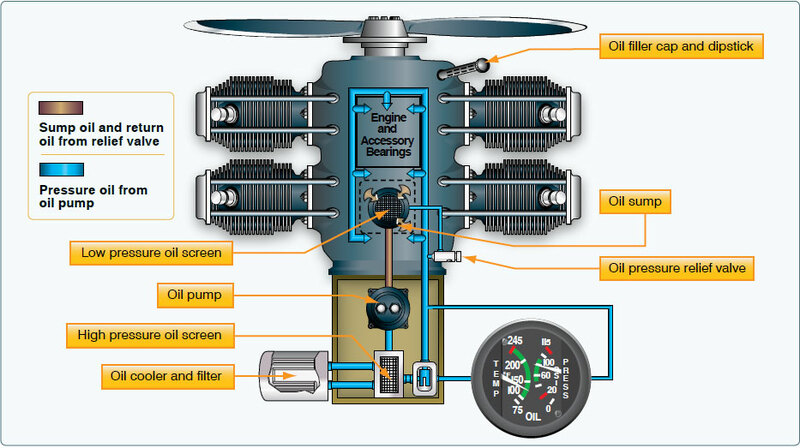 An oil pump also supplies oil pressure in a dry-sump system, but the source of the oil is located external to the engine in a separate oil tank. After oil is routed through the engine, it is pumped from the various locations in the engine back to the oil tank by scavenge pumps. Dry-sump systems allow for a greater volume of oil to be supplied to the engine, which makes them more suitable for very large reciprocating engines. The oil pressure gauge provides a direct indication of the oil system operation. It ensures the pressure in pounds per square inch (psi) of the oil supplied to the engine. Green indicates the normal operating range, while red indicates the minimum and maximum pressures. There should be an indication of oil pressure during engine start. Refer to the AFM/POH for manufacturer limitations. The oil temperature gauge measures the temperature of oil. A green area shows the normal operating range, and the red line indicates the maximum allowable temperature. Unlike oil pressure, changes in oil temperature occur more slowly. This is particularly noticeable after starting a cold engine, when it may take several minutes or longer for the gauge to show any increase in oil temperature. 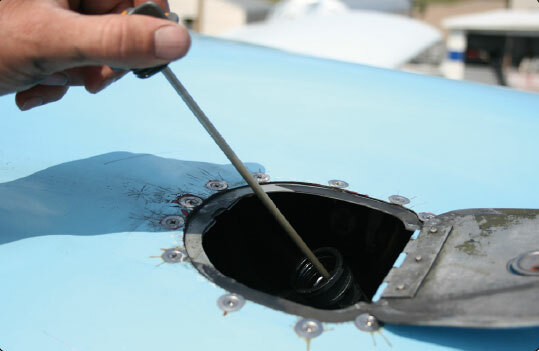 Check oil temperature periodically during flight especially when operating in high or low ambient air temperature. High oil temperature indications may signal a plugged oil line, a low oil quantity, a blocked oil cooler, or a defective temperature gauge. Low oil temperature indications may signal improper oil viscosity during cold weather operations. Figure 7-18. Always check the engine oil level during the preflight inspection.